Here’s the latest Dark Side, due in from the printers this Friday. 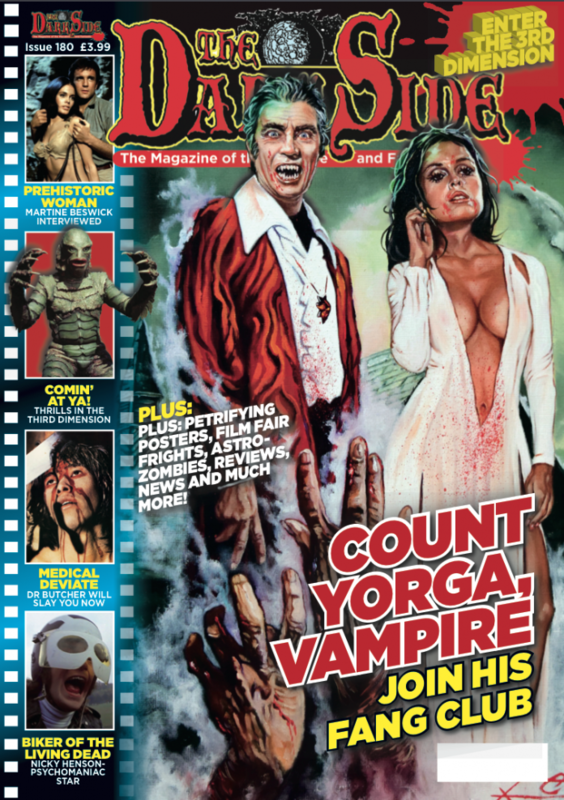 Another classic Rick Melton cover accompanies a superb article by Denis Meikle about the late, great Count Yorga himself, Robert Quarry. Denis actually knew Robert and even went round the pub with him so expect a really candid portrait. We’re also looking at the 3D explosion of the 1950s, shooting the breeze with Hammer icon Martine Beswicke, reminiscing about the Scala and making house calls with Dr. Butcher. Nicky Henson chats about his memories of Psychomania and Witchfinder General and we pay tribute to Ted Meikels as well as reporting on our experiences at the London Film Fair. Oh, and don’t forget to pick up our Horror Classics Special too for a really cool and ghoulish yule!